Unit designed for Class I, Division II, and Class II, Division I service. 2-ton Harrington air hoist with powered trolley and energy chain package. Custom Spider-Lift™ bulk bag lifting frame designed to integrate with custom bag elongation system. 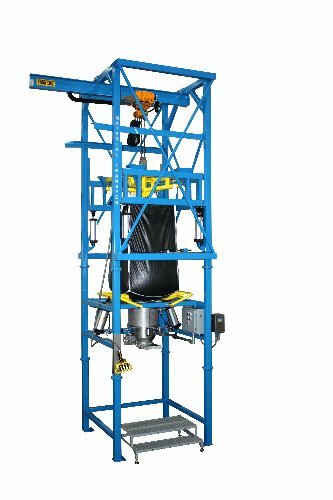 Unit features a pneumatically actuated bulk bag lifting system which automatically elongates the bulk bag during the unloading process for maximum product discharge. 304 stainless steel Flo-Lock™ discharge gate quickly halts material flow for partial bag discharge. Heavy-duty Flo-Master™ “breaker bar” bag massaging system with tubular frames break up clumps and promote positive material flow. 304 stainless steel Seal-Master™ bag spout access chamber with “gull wing” doors allows optimal access to discharge spout. 304 stainless steel Sure-Seal™ bag spout clamping system for dust tight product discharge. 304 stainless steel product discharge transition features a Salina Vortex orifice gate and discharge nozzle. Unit features a Hoffman NEMA 4 control enclosure with a Type X purge system and relief vent. Unit includes an operator work access platform.